“Today is a very humbling day for me. It reminds me of my very first day at Microsoft, 22 years ago.” Those were the words Satya Nadella used to introduce himself as the new CEO of Microsoft in a memo to all company employees on 4 February 2014. Of course, it was nothing like his first day at Microsoft. The IT, business and analyst worlds weren’t waiting to hear about his arrival from Sun 22 years ago. Websites, magazines and newspapers did not devote pages to the announcement of his appointment at the company back in 1992. He added that it was important to focus on “what Microsoft can uniquely contribute to the world. The opportunity ahead will require us to re-imagine a lot of what we have done in the past for a mobile and cloud-first world, and do new things”. He also said Microsoft had to start “with clarity of purpose and sense of mission that will lead us to imagine the impossible and deliver it”. As has been noted by other commentators, the memo was light on product details and some found it intriguing that Nadella did not mention the one word which, for many years, has been the centre of gravity for so many of Microsoft’s announcements: Windows. They may have been reading a little too much into that, however, when you consider that Steve Ballmer’s retirement memo to employees back in August 2013 didn’t mention Windows either – and noone can accuse the man who shouted “Windows, Windows, Windows!” of being reluctant to extol the virtues of Microsoft’s operating system (OS) at every opportunity. While many people did not view Nadella’s appointment as “more of the same”, there were quite a few who considered him a “safe pick” as a company insider. FBR Capital Markets' Daniel Ives told financial news publisher Barron’s that – while it viewed Nadella “as ‘the safe pick’ as Microsoft continues down the right lane of the highway at 55mph with its new CEO in hand – the fear among many investors is that other tech vendors from social, enterprise, mobile and the tablet segments continue to easily speed by the company in the left lane of innovation and growth”. He was driving in the US, obviously. Separately, Ives told MarketWatch that “picking a core insider down the hall from Mr Ballmer is an underwhelming pick, relative to the high hopes that investors had when this process started”. But they also accepted it could be a weakness. “His insider status raises the risk of his being overly respectful of existing businesses and hanging back from tough decisions that potentially threaten them but are critical to generating innovation,” they wrote. “And he will need to shake up what is widely viewed as a culturally dysfunctional management structure.” Nadella had to quickly demonstrate that he was not “backing a ‘business as usual’ strategy”. They suggested Nadella’s main challenge lies in “evolving Microsoft’s existing businesses (including its enterprise offerings, which represent half of its current revenue) while re-inventing Microsoft to make it relevant in mobile and cloud-centric markets”. You will note those were the same issues Nadella broached in his memo to Microsoft employees. IDC analyst David Bradshaw argued things were not likely to change much in the short term, because Nadella had already helped to shape much of Microsoft’s existing strategy, “and the two previous CEOs will both continue to have a strong influence on the company”. He suggested this was “a good thing” in most respects. But Bradshaw also highlighted mobility as “the most urgent area of action” for Nadella, adding that he faced “some tough choices for Microsoft to increase its relevance for users of smart mobile devices”. It was noticeable that there was nary a mention of Windows in most of the analysis, demonstrating by omission just how much the status of the OS has diminished from the days when Microsoft was all about “Windows, Windows, Windows”. The OS was one of the company’s crown jewels, along with Office, for many years. Clive Longbottom, service director of business process analysis at Quocirca, says Office is looking reasonably placed for the future with the emergence of Office 365. But he adds: “It needs pushing more and it needs to be made more functionally relevant on BYOD devices.” Nevertheless, he doesn’t see much cause for concern for Microsoft, because Google and others “have signally failed to really take the market away from Microsoft”. The lack of commentary about Windows in the wake of Nadella’s appointment may reflect the difficulty Microsoft faces. If Office is making strides to the mobile/cloud future, Longbottom describes Windows as a completely different kettle of fish. Microsoft’s tardiness in producing a Windows OS for tablets, the lack of care it took over how Windows 8 works on a tablet and the debacle over Windows RT, he argues, “has really dented Microsoft’s credibility, not just among the usual crowd of anti-Redmond techies, but with its core market of the buying public”. Longbottom says making Windows 8.1 a real competitor to Android and iOS will not be an easy task for Nadella. Adrian and Cearley at Gartner barely mention Windows in their analysis, although they do suggest Microsoft should produce a common Windows client environment with unified, cross platform services. “Microsoft must enable a complete, compelling set of apps that attracts developers and can compete with, and within, iOS and Android environments,” they write. They predict that, although there will be no radical changes to Microsoft’s devices and services strategy, it will be worth watching for “organisational shifts, product design changes and updated product road maps – including Office, business intelligence and Microsoft Dynamics – to address a mobile and cloud-dominant world”. Longbottom has some reservations about Microsoft’s cloud strategy. He cites previous assurances that Azure would be made available to anyone who wanted it, so Microsoft cloud could be offered by any service provider that wanted to offer it. “Microsoft is still clinging on to Azure while telling its service provider prospects and customers that a pseudo-Azure can be built using a hodge-podge of existing products,” he states. This is where the issue of whether an insider is the best choice could be thrown into sharp relief. As an insider, Nadella may well have a good understanding of the company, but he may not have quite as good an understanding of where the company needs to go. As Adrian and Cearley note, as an insider he could be “overly respectful of existing businesses” and reluctant to take the tough decisions that threaten them, “but are critical to generating innovation”. There is also the issue of just how beneficial it will be to have Bill Gates hovering in the background, now the former CEO has agreed to take on the role of technology advisor and devote more time to the company “supporting Nadella in shaping technology and product direction”. 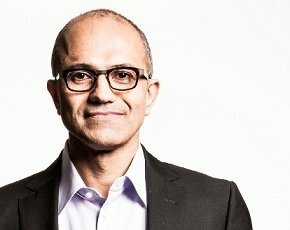 Gates issued a very supportive statement on Nadella’s appointment, saying: “During this time of transformation, there is no better person to lead Microsoft than Satya Nadella.” He describes Nadella as “a proven leader with hard-core engineering skills, business vision and the ability to bring people together”. Nadella’s vision for how technology will be used and experienced around the world “is exactly what Microsoft needs as the company enters its next chapter of expanded product innovation and growth”. The issue isn’t really Nadella’s vision of the future of Microsoft – that appears to chime with the views of many analysts – but rather how much influence Gates will wield over it. For all his successes, Gates has made a number of notable mistakes in the past by failing to see beyond Windows. The most notable being his dismissal of the internet back in 1995 (although he recovered quickly). More ominously, given the emphasis on mobile, devices and cloud, he described the iPad as “a nice reader” before claiming netbooks would be the mainstream products in that space. He had a similar dismissive reaction to the iPod. Gates and his wife reportedly won’t let their children have Apple products. Does it matter? It might when you consider that one of the things Adrian and Cearley state that Microsoft must do is “acknowledge its customers’ heterogeneity by supporting Google and Apple client environments, the Linux/Java environment on servers, and cloud-based services in general”. Sometimes, you get the feeling that Gates doesn’t recognise the word heterogeneity at all. On that note, Longbottom believes Microsoft “needs to be able to offer services for write once, run anywhere app support, so making it easier for developers to write for multiple platforms at the same time, and make one of Microsoft’s weaknesses (not as many apps as Android and iOS) into one of its strengths (write for either of the other two platforms, run in the Microsoft environment)”. Microsoft is currently embarking on a transition from its roots as an OS and software company to a devices and services strategy, to the extent of making some of those devices itself and preparing to bring more into the company when the Nokia acquisition is completed. Opinion is divided over whether getting into the hardware business makes sense for Microsoft. The history of the Xbox has been chequered and Surface tablets, while seeking to establish a design benchmark for Windows-based tablets, haven’t exactly been a roaring success to date. The Zune player stands as an embarrassing reminder of what happens when Microsoft gets the hardware wrong. Longbottom is scathing about the decision to acquire Nokia describing it as “not Microsoft’s smartest move”, arguing the company pushed other handset manufacturers away when it bought Nokia. He says Nokia is “an expensive, very large elephant in the room that he [Nadella] has to stop from going white”. Nadella won’t have any shortage of people offering advice from the sidelines as he tries to plot a course to help Microsoft retain its influence and position in the 21st century. There will be a few siren voices outside and inside the firm telling him what he should and shouldn’t do. Longbottom believes Nadella “has an amazing opportunity to be the Lou Gerstner of Microsoft” and transform the company in the same way that Gerstner did for IBM. But he warns: “With the amount of money that Microsoft is investing in him, it just has to be hoped that he doesn’t turn out to be a Carly Fiorina”. In his memo, Nadella said very few companies had the talent, resources and perseverance to change the world. “Microsoft has proven that it has all three in abundance,” he wrote. While he was right to some extent, the brutal fact is that was then, this is now. Microsoft may well have all the qualities required to change the world but the world has already started changing without it. Could that be what made Nadella feel humbled on his first day as CEO?